Thanks to a rare cosmic alignment, astronomers have captured the most distant normal star ever observed, some 9 billion light years from Earth. While astronomers routinely study galaxies much farther away, they're visible only because they glow with the brightness of billions of stars. And a supernova, often brighter than the galaxy in which it sits, also can be visible across the entire universe. Beyond a distance of about 100 million light years, however, the stars in these galaxies are impossible to make out individually. But a phenomenon called gravitational lensing - the bending of light by massive galaxy clusters in the line of sight—can magnify the distant universe and make dim, far away objects visible. Typically, lensing magnifies galaxies by up to 50 times, but in this case, the star was magnified more than 2,000 times. It was discovered in NASA Hubble Space Telescope images taken in late April of 2016 and as recently as April 2017. "You can see individual galaxies out there, but this star is at least 100 times farther away than the next individual star we can study, except for supernova explosions," said former UC Berkeley postdoctoral scholar Patrick Kelly, now on the faculty at the University of Minnesota, Twin Cities. Kelly is first author of a paper about the discovery appearing online this week in advance of publication in the journal Nature Astronomy. 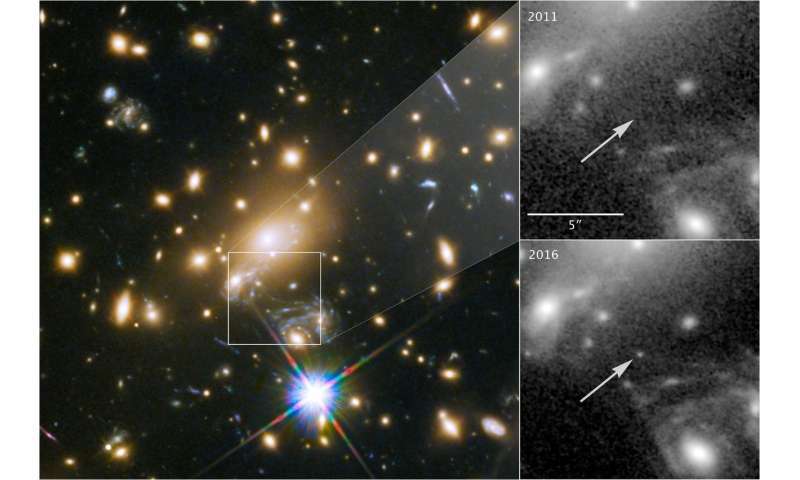 The discovery of the star, which astronomers often refer to as Icarus rather than by its formal name, MACS J1149 Lensed Star 1 (LS1), kicks off a new technique for astronomers to study individual stars in galaxies formed during the earliest days of the universe. These observations can provide a rare look at how stars evolve, especially the most luminous ones. "For the first time ever we're seeing an individual normal star - not a supernova, not a gamma ray burst, but a single stable star - at a distance of nine billion light years," said Alex Filippenko, a professor of astronomy at UC Berkeley and one of many co-authors of the report. "These lenses are amazing cosmic telescopes." The astronomy team also used Icarus to test and reject one theory of dark matter - that it consists of numerous primordial black holes lurking inside galaxy clusters—and to probe the make-up of normal matter and dark matter in the galaxy cluster. Kelly noticed the star while monitoring a supernova he had discovered in 2014 while using Hubble to peer through a gravitational lens in the constellation Leo. That supernova, dubbed SN Refsdal in honor of the late Norwegian astrophysicist Sjur Refsdal, a pioneer of gravitational lensing studies, was split into four images by the lens, a massive galaxy cluster called MACS J1149+2223, located about 5 billion light years from Earth. Suspecting that Icarus might be more highly magnified than SN Refsdal, Kelly and his team analyzed the colors of the light coming from it and discovered it was a single star, a blue supergiant. This B-type star is much larger, more massive, hotter and possibly hundreds of thousands of times intrinsically brighter than our Sun, though still much too far away to see without the amplification of gravitational lensing. By modeling the lens, they concluded that the tremendous apparent brightening of Icarus was probably caused by a unique effect of gravitational lensing. While an extended lens, like a galaxy cluster, can only magnify a background object up to 50 times, smaller objects can magnify much more. A single star in a foreground lens, if precisely aligned with a background star, can magnify the background star thousands of times. In this case, a star about the size of our sun briefly passed directly through the line of sight between the distant star Icarus and Hubble, boosting its brightness more than 2,000 times. In fact, if the alignment was perfect, that single star within the cluster turned the light from the distant star into an "Einstein ring": a halo of light created when light from the distant star bends around all sides of the lensing star. The ring is too small to discern from this distance, but the effect made the star easily visible by magnifying its apparent brightness. Kelly saw a second star in the Hubble image, which could either be a mirror image of Icarus, or a different star being gravitationally lensed. "There are alignments like this all over the place as background stars or stars in lensing galaxies move around, offering the possibility of studying very distant stars dating from the early universe, just as we have been using gravitational lensing to study distant galaxies," Filippenko said. "For this type of research, nature has provided us with a larger telescope than we can possibly build!" As for Icarus, the astronomers predict that it will be magnified many times over the next decade as cluster stars move around, perhaps increasing its brightness as much as 10,000 times.